Leadwork is still often carried out by a plumber, recalling the origin of the trade. But there are specialist leadwork companies in Northern Ireland who are capable of very high standard work. Lead is an extremely durable and flexible material but it does demand expertise. Good detailing and practice are essential to ensure excessive thermal movement does not open joints, sag flashings or stretch large flat sheets so that they split open. Old buildings sometimes have complex roof structures with hidden gutters and valleys. Leaks are sources of problems which may be out of sight, while slow leaks saturate roof timbers and may lead to dry rot. Valleys and valley gutters should be broad, laid to good falls and easily cleaned. Overflows should be positioned in prominent locations to warn of gutter blockages; regular maintenance is essential. In important buildings moisture sensitive alarms can be installed underneath hidden valleys to warn of damp penetration. Flashings on chimneys, parapets, abutments etc. 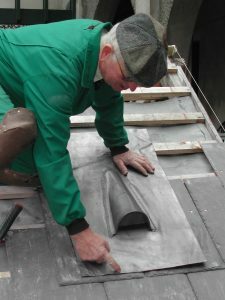 all require well detailed lead of appropriate thickness, size and design. NIEAs policy is that lead should be retained wherever possible. When replacement is necessary, it is desirable to use lead on a like-for-like basis, with appropriate security measures installed to deter theft. In some circumstances like-for-like replacement following a theft is not prudent. In such situations, if the Agency are persuaded that security measures are unlikely to prevent further attacks, they will consider Listed Building Consent (LBC) proposals for the replacement of stolen lead with an alternative material. Proposed alternative materials should mimic the visual and physical characteristics of lead as closely as possible. Replacement lead is grant eligible through the NIEA:HED scheme, alternatives are not. The Lead Sheet Association publishes details of good practice, carries out research and offers an advice service. Copper roofing is the traditional material for domes and cupolas, and correct installation is a skilled trade. 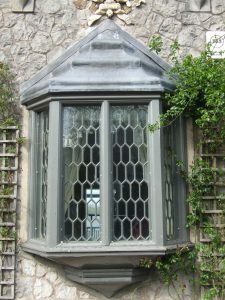 It is a versatile and very attractive material, and can now be supplied in prepatinated form to avoid the problems associated with unsightly weathering in the early years.